Once the cause or causes of the moss have been identified a moss eradication programme needs to be set in place to ensure that the moss will not return once it is removed. Applying iron is most effective way to kill moss as it ‘burns’ the moss right through to its rhyzomes. Applying iron should be done with care as over-application will kill the grass, whereas too little will not produce the desired result of a moss free lawn. 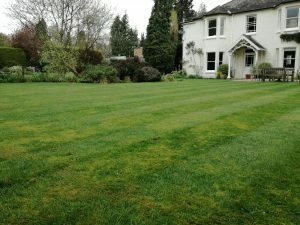 Removal of the cause(s) will result in the slow disappearance of the moss problem and the prevention of its return, this approach whist focusing on lawn growth is one we recommend with moss dominated lawns. Removing the cause(s) whilst focusing on lawn growth is a slower approach than just using moss killer but is far less destructive. Just using moss killer in moss dominated lawns will result in large patches of bare earth developing which will require over-seeding, which can take months to establish, or re-turfing the areas affected.